What’s the opposite of green? If anything, it’s convenience. It’s so much more convenient to drive than to ride a bike. It’s convenient to accept a new plastic bag each time you shop rather than remembering to bring your own reusable bag—and wash it when it’s dirty. The garden is one place where convenience is king. It’s so much easier to use chemicals rather than go organic. And it’s also easier to till and weed with gas- or electric-powered machines rather than the inconvenient work of doing it by hand. But going green in the garden and foregoing convenience can pay off quite well, not even counting the health benefits of chemical-free veggies. You can use your garden like a backyard gym—getting strong and fit as you grow your own food. For example, every garden begins with getting the ground ready. It’s convenient to get rid of weeds with a whacker and turn the soil over with a big rented tiller. But doing the job by hand—or rather, with a self-powered shovel—will give your entire body a great workout, especially your legs, glutes and core. Water the ground thoroughly a few days before you plan to start prepping the soil. Wear shoes that have a solid bottom, like some old athletic shoes, not those flexible rubber things. Step on the shovel with one foot and dig it in by placing all your weight on that foot. This helps your balance as well as your thigh muscles. When you lift the shovel full of dirt, bend at the hips and keep your back straight. Turn slightly sideways to turn the dirt over; this works your core. But here’s the important bit: If you use your left foot first, use your right foot the next time you dig the shovel into the ground. If your left arm is in the lowest position when you lift the shovel, put your right arm in the lowest position the next time. In other words, make sure you’re exercising each limb equally. Weed as you hand-till the soil. But use two buckets, one on each side. Twist to alternately toss the weeds to the left and right. Do the same for the rocks you turn up as you till. You’ll be working your obliques, the often-neglected muscles on the sides of your abs. You’ll also be improving the accuracy of your aim, which is always useful. 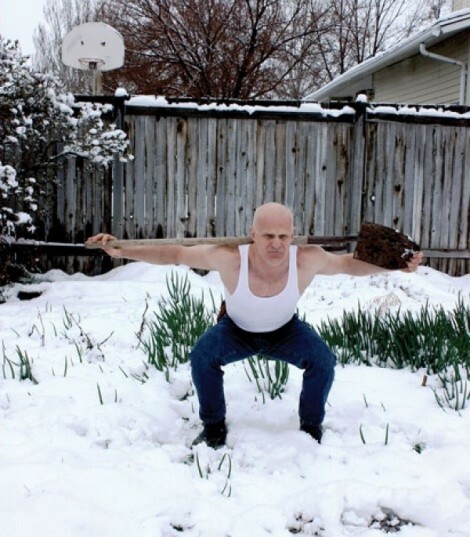 You can do two kinds of squats in the garden—a functional one where you squat to pull out the weeds from your hand-tilled earth, or a “bar” squat with a shovel on your shoulders that will help stretch your whole shoulder capsule, though it won’t serve any garden-related function. Remember, whenever you squat or stoop, keep your spine straight, never curved. Most gardeners kneel to plant seeds or seedlings, sliding around on their knees as they move around the planting area. Instead, make it more of a workout by standing up and kneeling down again each time you move, even if it’s just a few inches over. This is an effective body-weight exercise that works the entire lower body, including the important spinal erectors. After your garden begins growing, you can also use it to improve flexibility by staying in one spot and stretching in all directions to reach out for weeds to pull, rather than moving around to get closer to them. Gardener’s hint: If you’ve got deep-rooted alfalfa in your garden area, it may be hard to dig up because the root is so thick and deep. You may get rid of the clover-like leaves, but if there’s still a root, new leaves will be back in a week. Work your legs by digging down at least 12 inches, then use a sharp knife or pruner to cut through the tough root. It usually won’t grow back.